So, it's pretty obvious, but these were taken before I chopped my hair off. As much as I do like the way my hair looks long, I made the right decision. And, it's just hair. It will grown back. When I was in middle school I was strangely attached to my hair and every time I went to the salon I would tell them "keep it all one length, take off as little as possible." I don't know if you know this (I didn't) but that is not the recipe to lovely hair. I may or may not have had the nickname "horsehair" for a while. Second thing, this dress does not look flattering in these pictures at all. I should have worn a belt, but this day was one of those "get ready in 10 seconds" days. You live and you learn, I guess. Happy Monday, friends! 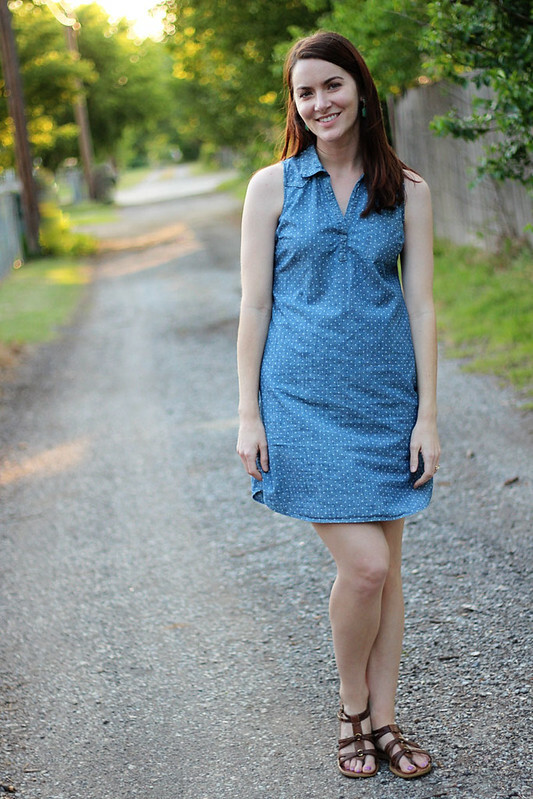 *Linking up with Lauren, DC in style, Molly & Dress Week! You always look gorgeous in whatever you have on, long hair or short! I always love how I can date my pictures by my hair style, ha! Hmm actually I think this dress looks lovely on you! It will look good with a belt too but you can totally pull this off without it. Lol, I love your honesty in your posts! I like this dress and think you can wear it with or without a belt. And I really like the new hair cut you debuted last week! Being called "horsehair" is unfortunate, but in third grade, I asked for hair that I could put in a ponytail, but without having to deal with a lot of hair on the top. Essentially, it was the classiest mullet you've ever seen. What a CUTE dress! You can always add a belt later too to mix it up! LOL! I was the victim of a very unfortunate short haircut in 2nd grade, so I'm always super nervous about getting too much cut off. And this dress is nowhere near "not flattering." You look great! I don't think that dress is unflattering at all! I like the polka dot fabric! I hate those 10 seconds to get ready days, but they have been happening more and more for me because I haven't been good about laying out my outfits the night before! I really like this dress on you!! The polka dots are so fun! I actually really like this dress on you :) It looks like a shift dress and you look fab girl! It's an adorable dress! I can see a belt jazzing it up, but I think it also looks great like this - so simple and easy for summer. 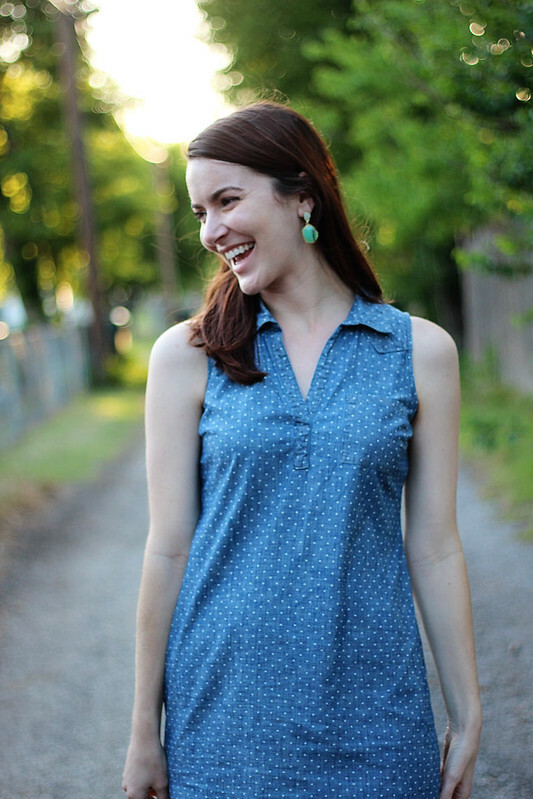 Stopping by from Heidi & Andi's dresses week link up! I think the fun earrings and CUTE shoes totally complete the look. Sometimes, simple is better, especially if you're on the run! That dress is so adorable! 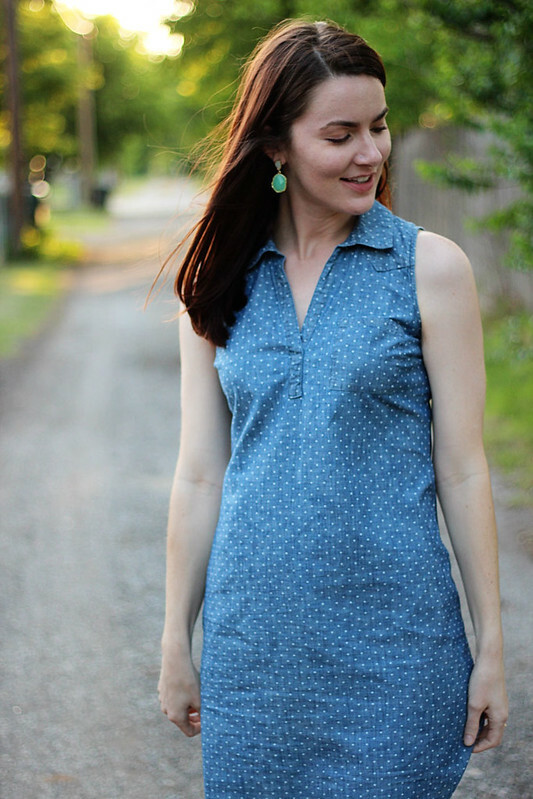 I love anything chambray, and the fact that it is polka dot makes it that much better. And I think it looks awesome on you just the way it is! Even if the pictures don't do it justice, I can still tell that dress is super cute and comfortable. I've done so many different things with my hair over the years, you do come to terms with the fact that it grows back, no matter how much or little you like how it currently is. That dress is actually super cute just the way it is! It looks super comfy and stylish and I'm sure you could style it a TON of ways on days where you have some extra time. I know how you felt about your long hair. I'm a bit attached to it although there are days where I just want to chop it all off! That dress looks so great on you! 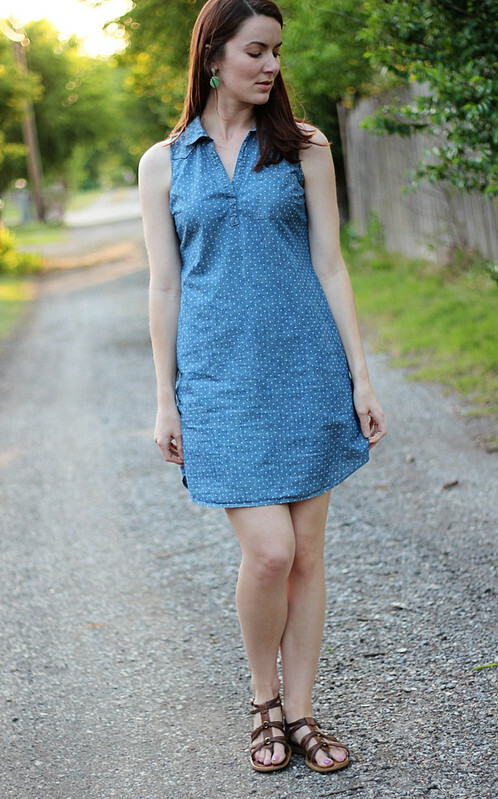 What a classic summer staple! This dress is so adorable on you! I love the polka dots! I actually love the way the dress looks on you - I wouldn't have changed a thing!! i think the dress is super cute! Hi Ashley. Even-though I haven't commented in a while I have stopped by at least twice. I did see your cute haircut and I agree it's just hair. FYI (the only one I am actually telling =D) I will be debuting a haircut on the blog tomorrow. Yep. I love your dress and I want the dress and earrings. Casual polished at its best!